This is the first time Live and Loud! has featured Joy Division. Long overdue! This is from their short European tour in January 1980 where they played in the Netherlands, Belgium and Germany. They’d released their debut album Unknown Pleasures in the summer of 1979 and their 1st non-EP single, Transmission, the following November. After returning from the tour, the band recorded their 2nd and final album, Closer, just 2 months later. 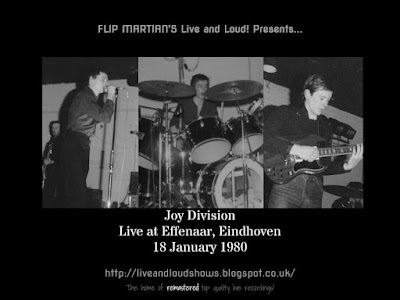 That finished, the band played more dates in the UK and were due to fly out to begin their first tour of America when singer Ian Curtis sadly committed suicide the day before. The remaining members, as everyone surely knows, went on to change their name to New Order - a band who will also be getting the Live and Loud! treatment shortly. The show you’re about to hear features only Colony from the forthcoming Closer - the remainder of this 16 song set being made up of tracks from Unknown Pleasures and single and EP-only releases.The recording did have a few defects, with some bass distortion and tape errors here and there - especially on the first couple of tracks. I've done what I could to sort them out, as well as EQ the recording to make it far clearer than the original. I hope you agree it was worth it! Incidentally, I also have a recording by Joy Division when they were known as Warsaw, from 1977 - I hope to get that remastered in 2017. In the meantime, this show is available for free download HERE as 1 MP3 file. Or, if you would like to have separate tagged MP3s, or even lossless files in FLAC format, head on over to the Donations tab to see how you can obtain these for a very small donation towards the site costs.